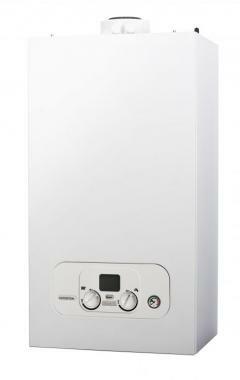 The Potterton Assure combi gas boiler is an highly dependable condensing wall mounted unit. With this boiler having a variety of smart features you can be sure you're getting a boiler that is extremely efficient, proved by its efficiency rating of 93% (making the boiler A rated). With this unit also coming with an output rating of 25kW it is perfectly suited for the smaller homes with only one bathroom and not such a high demand for heating or hot water. This boiler is a compact unit that can fit in a cupboard helping to save you space in your home. This is also a lightweight unit with 29kg lift weight - another great feature for making it easy to install. This boiler comes with a variety of features, with it having front access to all components helping to save time. It has flueing options of up to 20m for flexibility in where it can be placed, pipes behind facility, boiler casing and a built in drip tray to protect against water ingress. With it also coming with vertical packaging it allows for ease of access. It also comes with an optional safety assist which helps to protect vulnerable residents by locking controls. It is a combi boiler which means it supplies hot water and heating on demand by using the mains water supply, this means you don't need to have bulky tanks or cylinders. This boiler is a highly dependable unit that comes available in an 25kW output as well as a 30kW output. This boiler comes with 2 years warranty to give you peace of mind that you're getting an boiler that won't let you down.